Reporting Defaults – specifies a period used in the client GUI to create and show reports (the number of days and hours). The default reporting period is one day (24 hours). It is useless to set short report intervals (less than several hours) since all the performance graphs display averages for 10-minute intervals, so they will have just a few points for too short a period. 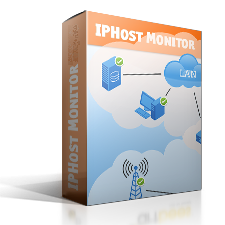 You can also control whether the reports produced by IPHost Network Monitor should include stopped monitors or monitors that have just been discovered but not started yet. 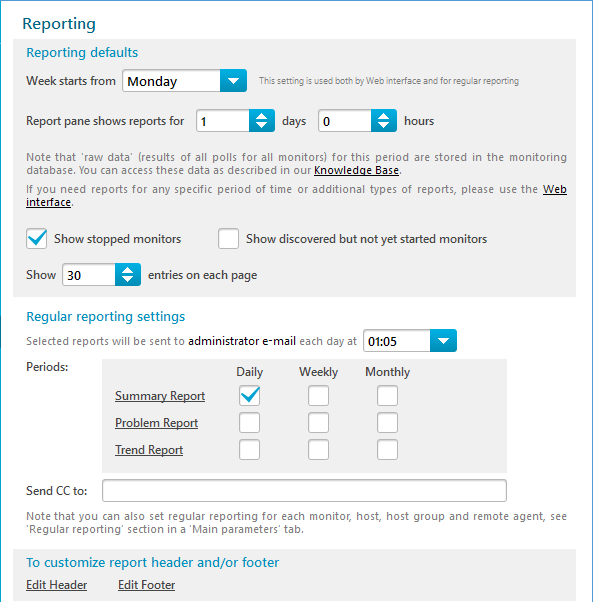 Regular reporting settings – indicates what reports (Summary and/or Problem and/or Trend) should be sent daily, weekly, and monthly. The daily Summary report cannot be disabled; it proves that the Monitoring service works as expected, and provides you with up-to-date information on your network every morning. Regular reports are always sent to the Administrator e-mail account ($AdminMail). On this page you can also specify a CC address list (comma separated) to send reports to. You can also edit these files by clicking on the [edit header] and [edit footer] links in any HTML report. Also, you can edit these files directly in the directory where they are located. You can edit the files to add your company’s logo, or whatever relevant information you want to add to reports. $WebInterfaceUrl The http://yourhost.yourdomain:8084/nms part of the Web interface URLs. $ReportType A report type string: “Summary report”, “Trend report”, “Problem report” or “Logs”. $ObjectName An object name: “All hosts” for overall reports, a Host group name, host name or monitor name (the last – in the form “Monitor name on host name”, e.g. “PING on myhost.mydomain”).